Wednesday 3rd October 2018, 6:30 pm. We all work hard to deliver our projects on time, within budget, and to our clients’ satisfaction. However, how do we ensure that this hard work actually meet the real needs of users? Will we really help them achieve what they need to achieve? Will the solutions be sustainable for the organisation? And ultimately will they fit in their environment, or simply add to the stresses of day-to-day working life? This is where Service Design comes in. Service Design allows us to gain a deep understanding of users and make sure that services and products work seamlessly together, to deliver the organisation’s strategy. Using service design tools and methodologies we can create solutions that are respectful, seamless, holistic, sustainable and realistic. This talk will provide a short introduction to Service Design, illustrated with case studies. Furthermore we will be “doing not talking” with plenty hands-on activities and discussions, giving you the opportunity to walk away with an understanding of design thinking. 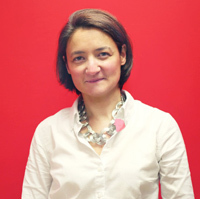 Anne is a project director at Snook, an award-winning agency with offices in Glasgow and London. Coming from a background in business and data analysis, she aims to get to the bottom of problems, unearth the impact throughout the organisation, design innovative solutions and follow them through; acoss private, public, and third sectors..